Mission Mosquito was a great, professional experience, which continues to influence my life and professional work. During my exchange, I met U.S. health experts who conduct daily research on Zika and other vector-borne diseases. Visiting the U.S Centers for Disease Control (CDC) and U.S. Department of State (DOS) were rare treats. Also fascinating was the opening of the Outbreak - Epidemics in a Connected World exhibit at the Smithsonian National Museum of Natural History. It is wonderful to know there are people committed to generating worldwide transformations, which I saw firsthand at the offices of Policy and Public Outreach and International Health and Biodefense at the State Department. These experiences changed my vision of how to approach complicated health issues, and I discovered the key to behavior change is making synergies among everyone in society – institutions and individuals. I didn’t have a holistic view of public health before the program; nor did I have a clear picture of how to apply communications in a more creative and strategic way. Mission Mosquito helped me to discover the challenges I want to achieve and the level I want to reach as a professional. Meeting people from 19 different countries helped me realize I can relate to anyone in the world culturally; I now have greater confidence in my interpersonal and professional communication skills. I am the Strategic Communicator at the Pan American Social Marketing Organization (PASMO), an organization that brings hope to vulnerable populations in my country. The agency also helps El Salvador with its capacity to detect, prevent, and respond to infectious diseases. As the Strategic Communicator, I coordinate digital strategies to promote behavioral change in hard-to-reach populations, manage activities to eliminate stigmas and discrimination towards people with HIV, and implement HIV testing and treatment programs. Furthermore, I support the creation of social media campaigns for Zika prevention education, and train public/private healthcare workers, as well as young people, about Zika and family planning. As an alumnus of the Mission Mosquito program, I have a professional advantage, since I learned advanced communication strategies used in other countries, and I brought those back to El Salvador. Global health security includes all of the health problems that affect countries – problems that we need to solve as a team; and this is done with solidarity and a lot of humanity. Although I only spent two weeks in the United States, I learned how to involve other sectors of society in national responses to health problems, and counter the notion of the “exclusive responsibility” of the Ministry of Health. I now understand how the private sector and the cultural sector – museums, theaters, social movements, art programs, etc. (whether they are private, governmental, or nonprofit) – can be very good allies. This would not have been possible without friends I made in the program – especially my Latin “colegas y amigos.” The entire group remains in contact on Facebook, sharing what we are now doing in our countries. Although I was one of the youngest participants, everyone treated me with respect and shared their wisdom. This community really helped me realize my future potential. Since returning, I’ve created an alliance between the Smithsonian Institution in the United States and the National Museum of Anthropology Dr. David I. Guzman. 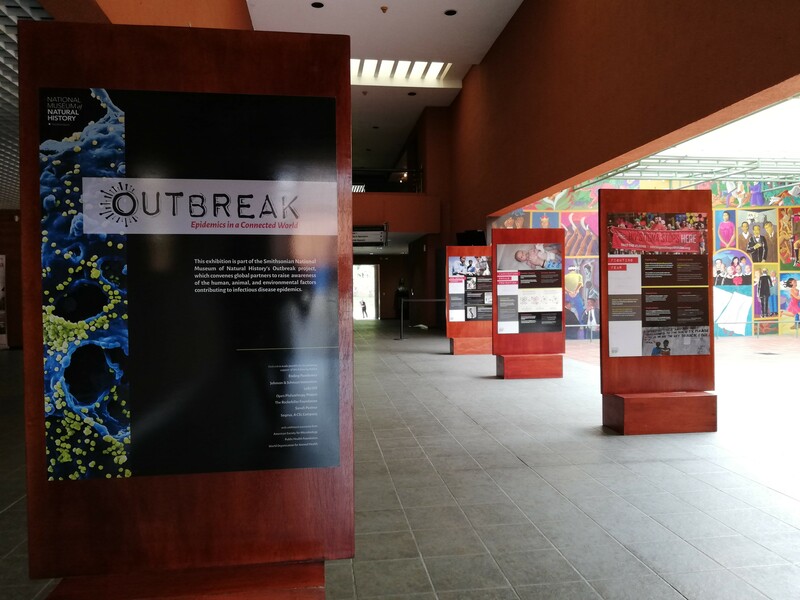 We hosted the mobile version of Outbreak for two months across three cities within the museum system. More than 2,000 people visited the exhibit, and I was pleased to see that the majority of them were students. I also organized a visit by Smithsonian curator Dr. Sabrina Sholts. She provided an overview of the exhibit to Ministry and USAID staff, and students. Additionally, I arranged a visit of State Department staff from Washington, D.C., so that the sponsors of my exchange program could learn about the great response work that our Zika Cluster team has achieved. My next project is developing a corporate social responsibility program – linking national institutions (including those that have never worked on health issues) so that we all participate in the prevention of viruses like Zika, and change the focus of our healthcare from “curative” to “preventative.” The objective is for people to understand that everyone has responsibility for public health, not the Ministry of Health alone. Community participation is imperative to successfully respond to infectious diseases.